Americans to be Crippled, Killed by New Vaccines? 1. Many new vaccines feature recombinant DNA. One piece of a deadly germ is inserted or spliced into other organisms, creating bio-engineered microbial molecules. To prompt the body to create antibodies to these recombinants, scientists have created deadly oil-based vaccine additives called adjuvants. Oil-based adjuvants cause extreme inflammation and animals injected with them always develop painful, incurable auto-immune diseases like multiple sclerosis, rheumatoid arthritis or systemic lupus. 2. Since Gulf War I, the military has been secretly putting an oil-based adjuvant called SQUALENE into certain experimental lots of military vaccines. Just like lab animals, thousands of soldiers given SQUALENE- laced vaccines have developed disabling auto-immune diseases. Independent researchers have found SQUALENE antibodies in these sick soldiers. In 2005, the military admitted that 1,200 military personnel who received anthrax vaccine before going to Iraq recently developed serious illnesses, including memory loss and chronic fatigue. 3. The military and federal health agencies have long kept their SQUALENE experiments on U.S. military troops secret because they know that oil-based adjuvants wreak havoc with immune function, causing the body to attack itself. Matsumoto documents how federal and military officials have often been caught lying about the SQUALENE in military vaccines. 4. Matsumoto warns that the National Institutes of Health has funded production of new vaccines for flu, human papilloma virus, malaria, HIV and herpes that also contain SQUALENE. The federal government has been running human clinical tests on these new commercial vaccines and test subjects have not been properly informed of the grave health dangers. Researchers have even found SQUALENE in some of the older vaccines containing tetanus and diphtheria toxoids. Should we wonder why auto-immune diseases like fibromyalgia and chronic fatigue are now rampant? 5. The Bush administration is funding development of new bio-warfare vaccines that will also contain oil- based SQUALENE adjuvants like MF59 or MPL. Because federal officials know that these vaccines may cause disability or death, legislation to protect vaccine makers from lawsuits is expected to be passed by Congress before the end of 2005. * If you become chronically ill from these vaccines, tough luck! *This legislation is the "Biodefense and Pandemic Vaccine and Drug Development Act of 2005" (or BioShield 2). It would strip Americans of the right to a trial by jury if harmed by an experimental drug or vaccine that they are forced by government to take whenever federal health officials declare a public health emergency. 6. Homeland Security laws can be implemented to force all Americans to accept vaccinations during a national crisis. Congress gave the Department of Defense and Health and Human Services (HHS) the power to make vaccination compulsory under Project Bioshield. Recently the Bush administration announced plans to use military troops to enforce medical martial law. Will we soon see the day when Americans are forcibly vaccinated with dangerous injections that cause them to become sick, crippled or dead—with no legal recourse? 1. 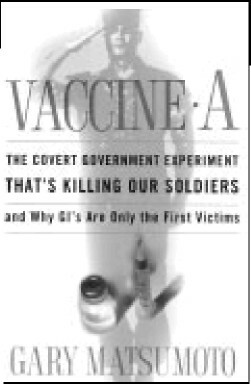 Read Vaccine A and alert everyone who will listen—especially those whose loved ones plan to volunteer their bodies for military service—that the coming wave of new vaccines will kill and maim more effectively than previous generations of vaccines. Matsumoto's book is well-documented with hundreds of footnotes and it proves that neither federal health agencies nor the military should be trusted with our bodies. 2. Go to www.vaclib.org and become vaccine literate. At this site, you can read scientific studies and historical information on all vaccines. You will quickly realize that the vaccine paradigm is a dangerous fraud. You will then be equipped to help us awaken our brainwashed and blindly faithful fellow Americans to the dangerous, toxic truth about injections. 3. Keep a distance of at least 10 feet between yourself and anyone who intends to jab you with vaccine. 4. The following congressmen are on record as favoring the passage of Bioshield 2 (S 1873 in the Senate, HR 3970 in the House): Republicans: Judd Gregg (NH), Bill Frist (TN), Mike Enzi (WY), Richard Burr (NC), Johhny Isakson (GA), Lamar Alexander (TN), Christopher Bond (MO), Pat Roberts (KS), John Ensign (NV) and Mike DeWine (OH). Democrats: Edward Kennedy (MA), Christopher Dodd (CT), Tom Harkin (IA), Barbara Mikulski (MD), Jegg Bingaman (NM), Patty Murray (WA), Jack Reed (RI), Hillary Clinton (NY). 5. Help us preserve state statutes that protect parental rights and vaccine exemptions for children in day cares and schools. Duplicate and share this flyer in order to create a critical mass of informed citizens who will refuse to be forcibly vaccinated with lethal cocktails during a real or contrived national emergency.